We travel all over the world for inspiration, and we always find so much beauty in other cultures. 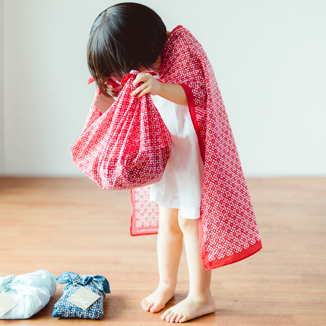 In Japan, we fell in love with furoshiki ("foo-roe-sh-kee")—a traditional wrapping cloth used to carry gifts or clothing. 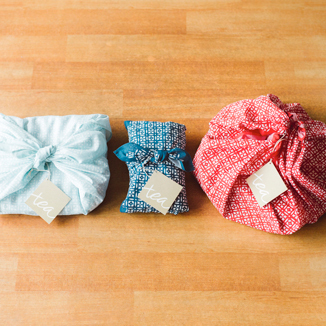 We love furoshiki as an elegant, versatile and earth-friendly way to wrap or transport a gift. 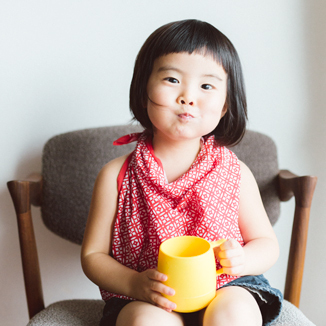 It can even be re-used as a scarf, a kerchief, a headband, a cape! 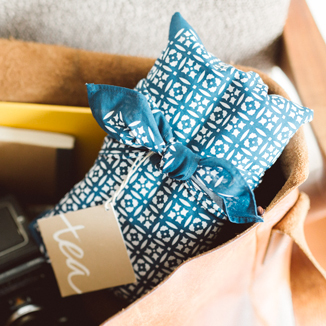 Since we don’t include prices on the packing slip, it can always be used as a gift receipt. Have you ever thought about wrapping gifts in something other than paper? During the winter holidays, 4 million tons of wrapping paper and shopping bags are thrown away. 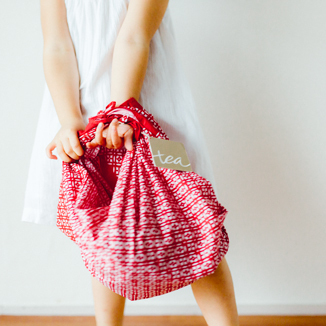 Wrap your gifts the eco-friendly way with our signature Furoshiki Gift Wrap, inspired by the artful Japanese tradition of wrapping gifts in beautiful swaths of cloth. 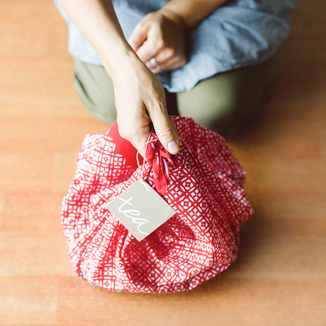 Your giftee can re-use and repurpose the cloth gift wrap any time of year. Learn how to use and reuse our Furoshiki Wrap with our step by step instructions or instructional video. 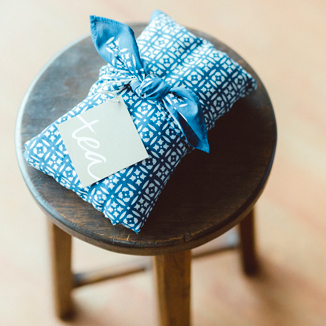 The Tea Gift Certificate is the perfect gift for everyone on your list. Simply tell us who the lucky recipient is, select the amount you'd like to send to them and add your own personal gift message. The gift recipient will receive an email that includes a unique code, the amount of your gift, your special message and details on how to redeem it. When will my gift recipient receive the Gift Certificate code? Gift Certificate emails are sent immediately after your order is placed unless a specific delivery date is specified. Are there shipping charges on Gift Certificates? Gift Certificates are sent via email. There are no shipping charges for them. Can I purchase an Gift Certificate in a denomination other than what I see on the site? No, but we offer four different amounts ranging from $25 to $200. Can an Gift Certificate be used more than once? Yes, an Gift Certificate can be used on as many orders as desired until the value is used up. Unfortunately, our Gift Certificates can only be used once per day because the available balance is updated nightly. Can an Gift certificate be used towards shipping and taxes? Yes, Gift Certificates can be spent on shipping, taxes, gift wrap and products. What if I have lost or misplaced my Gift Certificate code? Keeping track of the code is the recipient's responsibility. However, if you have lost your code or forgotten the balance on your Gift Certificate, give us a call and we'll see if we can look it up for you. We can usually find them if we know who originally purchased the Gift Certificate or by looking up the recipient's email address. Can I reload my Tea Gift Certificate? Once an Gift certificate is spent, we can't reload it. But you can always buy additional ones here. Coupons and discounts cannot be applied to Gift Certificate purchases. If merchandise items are included in your order, coupon value will only apply to merchandise items. Sales tax will not be applied to Gift Certificate purchases. If merchandise items are included in your order, tax will only apply to merchandise items. Tea Collection is not responsible for lost or stolen Gift Certificate codes. Gift Certificates are non-refundable and cannot be exchanged and cannot be redeemed for cash (except where required by law) or applied to a Tea Collection invoice. 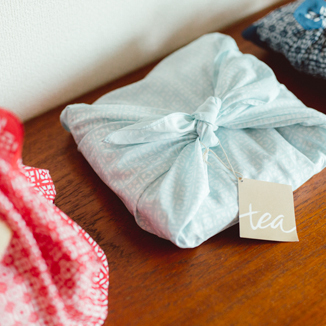 Gift Certificates can only be redeemed at teacollection.com or by calling 866.374.8747.